‘Arab Spring’ can be considered as one of the most remarkable events in the history of world politics. On December 18, 2010, a Tunisian young protestor burned himself in a public square of the city. This event triggered probably one of the most chaotic and long term uprisings in the Middle East. From the day of its initiation until the present, ‘Arab Spring’ in the Middle East created unstable political situation and several uprisings. In this chapter, we will first give general information about chaos theory, and then we will examine the ‘butterfly effect’ created by the Tunisian young protestor and process of Arab Spring in the Middle East regarding its extend and form in those countries within the framework of chaos theory. 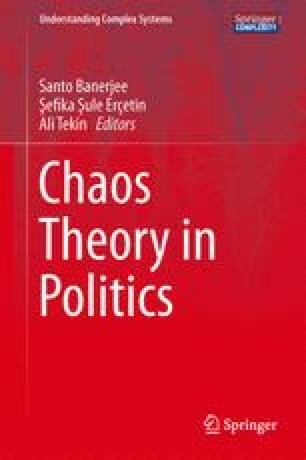 For the first part of this chapter, the spark created by the Tunisian young protestor and its effects can be analyzed under ‘butterfly effect’ perspective within chaos theory, arguing whether the events followed each other consecutively or randomly. The question is whether the incidents following each other have reasonable links of causality to one another, or the events defining the phenomena known as ‘Arab Spring’ have no predictable reasons and outcomes regardless of the regional, social and political differences. The events caused the collapse of the regimes in Tunisia, Egypt and Libya; they had very serious outcomes. However, current approaches generally fail in defining the panorama clearly, which does not help in finding a way out. The change started with young protestors rushing the streets and resulted in a completely new order, which resulted in somewhat greater turmoil in these countries, which was somewhat unpredictable through chain of causality. From the beginning to the end of the ‘butterfly effect,’ an analysis of present day situation raised the unpredictability to a new level. With the help of chaos theory, which has lately but very usefully revealed itself in social studies, phenomena of ‘Arab Spring’ is observed for discovering whether it is a new beginning for Middle Eastern countries with consecutive and predictable outcomes, or is a path to a much more devastating ‘Arab Winter’ just knocking the door. For want of a battle, the kingdom was lost!